Philibert de l'Orme was the son of a mason, born in Lyon, France. He spent three years in Rome and became fascinated by ancient architecture. King Henri II entrusted him with the supervision of Fontainebleau and Saint-Germain-en-Laye, so that he could weld their architecture and gardens. 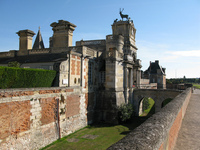 Philibert's most important surviving design is the Chateau and garden at Anet. His book, Nouvelles Inventions pour bien bastir et a petits frais (1561) was almost a building manual. His Le premier tome de l'Architecture (1567) was a theoretical humanist work.